135J4 Black Neoprene Poly-V Belt, Metric 4-PJ343 Drive Belt. Home > Heavy Duty V Belts > Poly-V Ribbed (Micro -V) Belts > J, PJ Section Poly-V (Micro V) Belts - 3/32" Rib Width. > 135J4 Poly-V Belt, Black Neoprene. Metric 4-PJ343 Drive Belt. 135J4 Poly-V Belt, Black Neoprene. Metric 4-PJ343 Drive Belt. 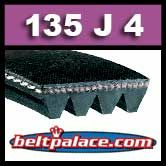 135J4 Poly-V Belt, Standard Duty Black Neoprene. Metric 4-PJ343 Drive Belt. CLEARANCE PRICED WHILE SUPPLIES LAST. LIMITED AVAILABILITY.